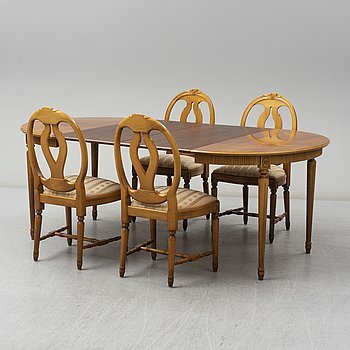 A dining table och four chairs, Gustavian style, second half of the 20th century. 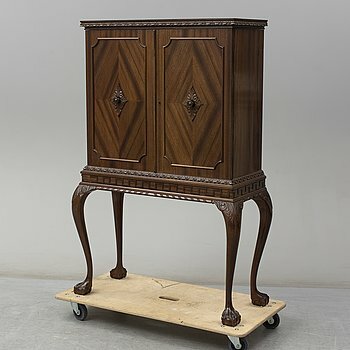 An early 20th century Chippendale-style cabinet. A runner Morocco, around 308 x 82 cm. 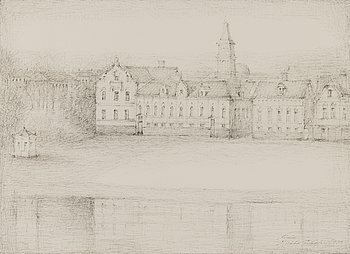 HILKKA INKALA, ink drawing, signed and dated Oulu 1979. A part silk Nain carpet ca 100 x 97 cm. A CARPET, kilim, around 240 x 147 cm. A RUNNER, Nain, 205 x 65 cm. 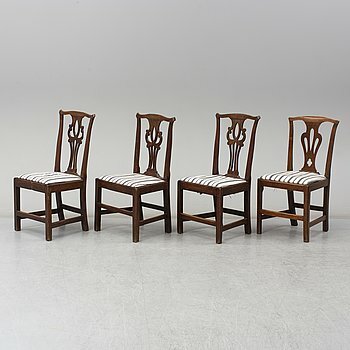 EINAR FORSETH, watercolour, signed and dated 1948.
a set of eight pine wood chairs. JOHANN BAPTIST HOMANN, map, copper engraving "Thuringae..." Nürnberg ca 1720. HALFDAN STRÖM, oil on canvas, signed and dated -99. WILLIAM RAYMOND DOMMERSEN, attributed to, oil on canavs. ERIK H OLSSON, 2 serigraphs, signed and numbered 40. ANNELI QVEFLANDER, mixed media on board, 1980s. An oriental carpet ca 189 x 118 cm. CARL MALMSTEN, a "Hemmakväll" sofa. HANS BERGSTRÖM, a ceiling lamp Ateljé Lyktan. PETER J LASSEN, a set of three shelf systems Montana. 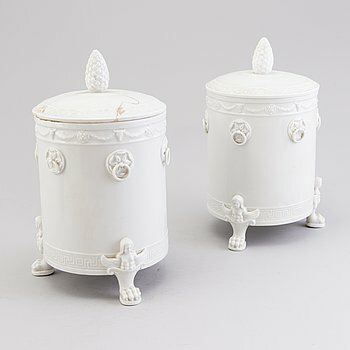 A pair of bedside tables first half of the 20th century. KARL INGELIUS, oil on canvas laid on board, signed and dated -15. 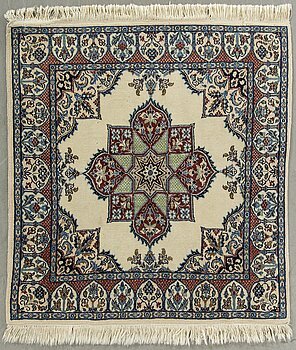 An Oriental carpet. 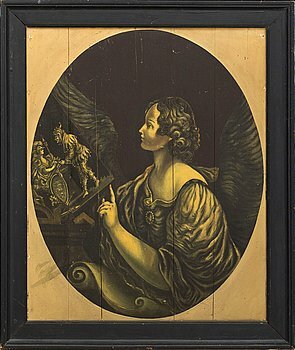 Circa 194x129 cm. A RUG, Old Esfahan, around 278 x 186 cm. An Afghan rug. 191 x 126 cm. A oil on cardbord by August Soldan. signed and dated 22.V.1920. ANNELI QVEFLANDER, mixed media on board, signed and dated -83. OLAVI UUSITALO, oil on canvas, signed and dated 1980. MATTI TASKINEN, oil on canvas, signed and dated 1947.
a table from the late 19th century. A CARPET, Nain part silk, so called 9 LAA, ca 320 x 203 cm. A CARPET, Figural Tabatbai, ca 268 x 178 cm. A first half of the 20th century painted chest of drawers. A large cultured South sea pearl and diamond pendant. A Christian Dior costume brooch, with paste stone. A 1960's teak and walnut dining table by Johannes Andersen. LANVIN, a knitted wool dress, Winter 2008, French size 40. A late 19th century baroque style cupboard. A pair of second half of the 20th century brass table lights. BERTIL WAHLBERG, oil on canvas, signed. KALEVALA KORU, viking jewellery, 5 pieces. A late 19th century birch sofa. NICOLAS SAMSON, map, copper engraving, Helsinge, Medelpadie, Angermannie..."Pierre Mariette, Paris, 1666. A FLATWEAVE RUNNER RUG, 290 x 86 cm. CHANEL, a dress and a shirt, size 44.
a oak desk from the early 20th century. A Swedish 1970s birch table. A mid 18th century oak secretaire. A 1960s Björn Hultén coffee table, Industri Ire AB. DINING TABLE, Rococo-style, mid 20th century. Three leaves included. A Gustavian style ceiling lamp, first half of the 20th century. RAGNHILD NORDENSTEN, 7 wood cuts in a portfolio, signed 13/25 1918. JAMES COIGNARD, carborundum signed and dated 16/60. A "Classic" Kajsa Aronsson carpet for Kasthall ca 350 x 150 cm. SVEN PALMQVIST, a pair of signed glass sculptures Orrefors late 20th century. LARS JONSSON, lithograph in colours signed and numered 100/220. ANDREAS POPPELIER, oil on canvas signed and dated 08. 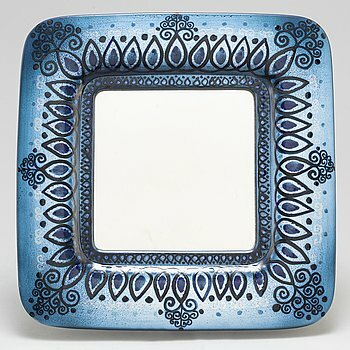 KAJ FRANCK 3-piece Ateenan Aamu Glass Pendant by Iittala. JUHANI TARNA, oil on canvas, signed and dated -64. A pair of 1920s armchairs. ÅKE HELLMAN, oil on canvas, signed and dated -41. HEIKKI TUOMELA, oil on canvas, signed and dated -73. A MAP, "Partie Septentrionale de la Russie Européenne…" SANTINI / VAUGONDY 1780s. ERIK RIISAGER-HANSEN , a 1960s '68' coffee table for Haslev Møbelfabrik, Denmark.